Newton Aycliffe suffered their second heavy defeat in successive Saturdays with this loss at home to Jarrow Roofing. The Boldon-based side achieved the double over Aycliffe with both games having the same goal difference. 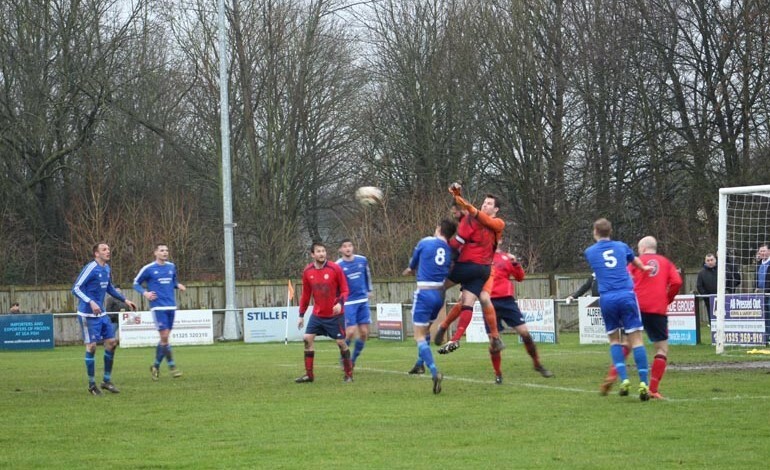 Aycliffe started the game with the same 11 players who had won at Washington in midweek, taking the club to the semi-finals of the Durham Challenge Cup for the first time in over 40 years. But manager Peter Dixon was forced to make an early change when left-back Andrew Green picked up an injury after just 10 minutes. The home side had chances in the first half and came close on 28 minutes when John Campbell played the ball to Matty Moffat who was through on goal only to be denied by an offside flag. Two minutes later Moffat came even closer when a scuffed shot was fumbled by the Roofing keeper who seemed to lose his footing on the heavy surface. From there it was Roofing who went on the attack and scored their first after 33 minutes. Shaun Vipond’s long range shot took a heavy deflection to wrong foot Lewis Brass in the Aycliffe goal. With the half-time whistle approaching the visitors made it 2-0. A shot from a corner was blocked by Brass but Richard Paxton beat the defenders to the rebound and found the net. The second half didn’t get any better for Aycliffe with Roofing’s third goal coming just after the hour. Unlike Moffat’s effort in the first half James Fairley benefitted from a close offside decision and ran through to slot the ball into the net. Roofing weren’t finished and grabbed their fourth with ten minutes remaining. Substitute Callum Paton struck a powerful shot which Brass got his fingers to. The ball struck the underside of the bar and bounced down, just over the line. Aycliffe now face Norton & Stockton Ancients at Moore Lane on Tuesday (9th February, kick-off 7.30pm). Norton had a good win over Consett on Saturday and will be looking to avenge the three points Aycliffe took from them earlier in the season.